Lens forward Aruna Dindane has been linked to a Monaco move in the past few days but won’t leave Lens for another French club, said the Club president. RC Lens Ivorian International forward Aruna Dindane has been linked with a move to Monaco ever since his agent hinted that he wouldn’t spend another season with the northern club. Monaco are known to be looking for a striker since Steve Savidan was diagnosed with a heart problem and it was confirmed that his career was effectively over. Dindane would certianly fit the bill as Monaco have been looking for someone of that calibre in the same price range. 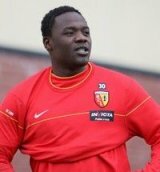 Aruna Dindane was one of the club’s main players during the 2007/2008 season and decided, despite some financial sacrifices, to stay with Lens after they were relegated. "There’s one chance out of a thousand that he will go to AS Monaco. I haven’t had any contact with Monaco yet and really, either he will go abroad or he will be staying at Lens next season." For a player with ambitions to play in both the African Cup of Nations in Angola and the World Cup in South Africa with the Ivory Coast national team, Dindane shouldn’t be too hard to convince to stay at Lens one more season.